Swing And A Hitch: New Bats Safer, But Power Wanes High school hitters have to use a different kind of metal bat this baseball season. The change is intended to reduce injuries on the field. But it might have another consequence — fewer home runs. Members of the Arlington Heights High School baseball team swing their old-style aluminum bats during the 2009 season in Fort Worth, Texas. This year, high school players will use a different type of metal bat that's designed to reduce injuries. 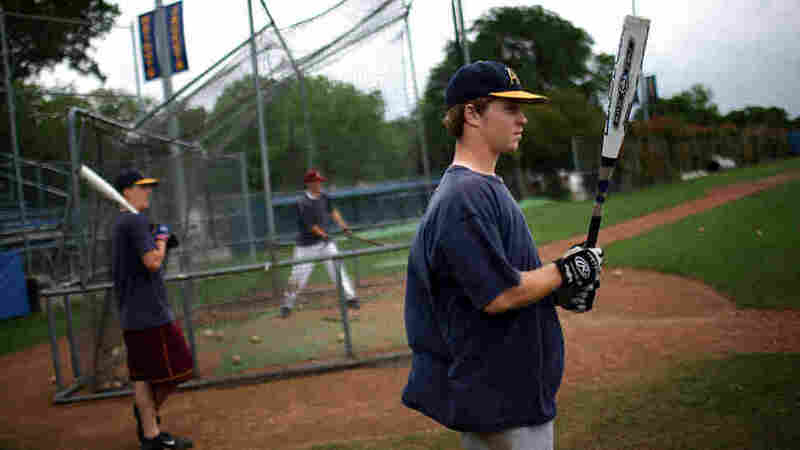 Baseball practice has just begun at many high schools across the country, but this year, the game is different. The National Federation of State High School Associations has adopted a new standard for baseball bats that is expected to change the way the game is played. The switch involves a change of bat — from a regular aluminum bat to a metal bat known as Batted-Ball Coefficient of Restitution, or BBCOR. The bats are less springy and have a smaller "sweet spot." In other words, they behave more like old-fashioned wooden bats. The idea is that since the balls come off the bats more slowly, there's a reduced potential for injury. But there's another consequence: fewer home runs. In college baseball, which adopted the standard last year, the rate of home runs per game fell almost in half. Antoine Williams, the baseball coach at the Maret School in Washington, D.C., tells All Things Considered host Robert Siegel that he expects the BBCOR bats to have the same effect on the high school game as well. "I think it's going to be a big deal," Williams says. "And watching the NCAA last year ... the numbers dropped offensively and you know, there was more of a premium on defense, and moving guys over — playing the game the right way." Changes in bat technology have historically changed the game, Williams says. Aluminum bats allowed for more home runs and balls hit in the gap, and he says he expects to see more one- and two-run games in the upcoming season. Andrew Culp, a junior who pitches and plays first base at Maret, says he can feel a difference when hitting. And although it may take some adjustments as a hitter, Culp says he's looking forward to pitching to players with the BBCOR bats. "[I'm] really excited about that, looking forward to getting bad contact with the smaller sweet spot and getting guys to roll over on balls," he says. "And you can pitch with a lot more confidence now ... and not be afraid to throw strikes." Why Not Use Wooden Bats? So why not just go back to wooden bats? The answer is obvious to Williams. "Finances — it's a lot more expensive. The aluminum bats, even though they're BBCOR-certified and perform much more like wood bats, they last longer," he says. "With the wood bats, you can break a wood bat, on average, once a game." While BBCOR bats like the one Culp uses may cost around $400, a wooden bat can run $85-$120, Williams says. Over the course of the season, he says a player might run through six wooden bats. The BBCOR bat is designed to stand the test of time. The final question is then for the people who coach, play and watch the game — will baseball still be as fun without so many home runs?